I'm thinking about cutting it into 4 sections and having everyone make their own mini pizzas! I would get the kids involved in making pizza together. We would have pizza and movie night. I would have my daughter help me make pizza using Pillsbury Artisan Pizza Crust for our family movie night. I would have a family pizza night. possibly use it for a get together on monday night as that's our regular pizza night anyways., yumm! Pizza night! That means no electronics at the table. I'd make a pizza for my mom's birthday party. I would make pizza and invite all of our family over for dinner. I'd make a couple little pizzas and we could have movie night. We would make it for Friday Pizza night!! I plan to let my 10 year old make dinner for the family by himself :). We will use it to have a family pizza night. we would have a pizza night where everyone would get to make pizzas with their favorite toppings! I would make Taco pizza! Everyone always comes running for that! Love when everyone is at the table together!!! I would invite the kids and grandkids over to help us eat the pizza. we will make the dinner as a family! I'd use it to make our family's favorite pizza, Hawaiian. Mini pizzas for a movie night. I'd let everyone help out with putting toppings on! Friday night is pizza night around here, but we usually have it delivered. I think it would be nice if we spent time making one together instead! A pizza family night sounds great. I just found a recipe for calzones that I have been wanting to try. This would be great for that for one of our family dinners. It looks just as easy to do as prepping a frozen pizza for the family, but with the added benefit of bringing the kids in to help and have fun! I plan on having the kids help me make the pizzas together, and pick out their own toppings! Thanks for the giveaway! We will all make it together since we all love veggie pizzas and really do prefer it homemade. Make pizza on the grill and eat it at the picnic table. Lots of Veggies and a Pesto Sauce sprinked with extra cheese! We'll do a healthy pizza pie with veggies. We always have Sunday dinner at my Mom's house -- and Pizza is our favourite! This will get everyone together! We'll have a top your own night with lots of veggies, cheeses and uncured pepperoni. When we make pizza, we always do it together. Either we make the crust from scratch or I pop open something like this, then the whole family helps top - sauce, cheese, toppings, spices, etc. Sometimes we change that into making calzones instead by cutting a crust like this into sections, stretching, and filling. I would invite everyone over for Pizza. I bet they all show up! Free meal, which is important to starving college students. I'll have the kids make the pizza with whatever toppings they want. I'd use it to make pizza with the kids on game night! We always make pizza on movie night on the weekends, and we all choose our favorite topping to put on the pizza. I'd definitely do the same with this pizza. I would have a family night with pizza games and movies. I love to make pizza with the family. Not only do we get to bond over dinner, we get to make it together too! We will make a white pizza with green peppers. By making pizza together as a family. This would be magnificent for movie-and-homemade-pizza night! I'm thinking pizza and a movie night with cuddling on the couch watching a family oriented comedy. We will be doing pizza turner overs with some bbq chicken!Then game night. I would make a nice cheese pizza for my family to enjoy together, and maybe there will be leftovers to take to work and school the nest day. topping the pizza with my daughter! I'd use it for a lazy meal night and let my family choose the toppings. Make a pizza with mozzerella & cheddar cheese, black & green olives, mild pepper rings, & mushrooms. I plan on making a pepperoni pizza! 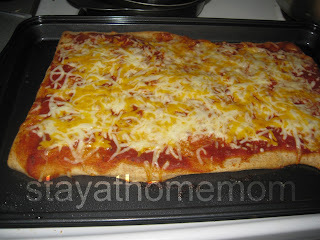 I would make a desert pizza that I know my kids and hubby would love. 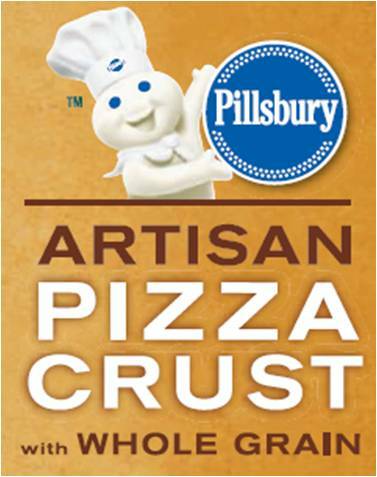 Tell me how do you plan to use Pillsbury Artisan Pizza Crust with Whole Grain to bring the whole family together for dinner? We will let everyone choose one topping to go on the pizza. We'll make pizza with the grandson when he comes over. Pizza and family game night!! I would make a pizza with different toppings for each person's liking. I would make it a pizza and family game night. I would impress my neighbor's with a homemade pizza since I'm not much for cooking. we have pizza and movie night and then we play board games, it's a lot of fun! If I make a pizza, believe me, the whole family would come together to eat because everyone loves pizza. I would make a pizza with all my family's faveorite toppings! 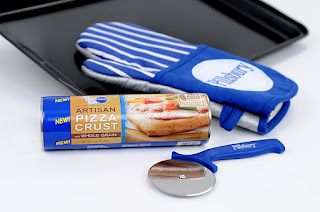 I would save the baking sheet for cookies and use these mini pizza pans that I've never used yet. Toppings bar - everyone makes their own pizza! Make a pizza with everyone's favorite topping! Have the kids come and buy a bunch of toppings and have everyone have what they like. I would have my daughter help me make the pizza and then have a movie night. We would plan a pizza making party & everyone could pick out toppings for their mini pizza! I will make it on family game night so that we can have good food and good fun. We would make pizza together for family night.